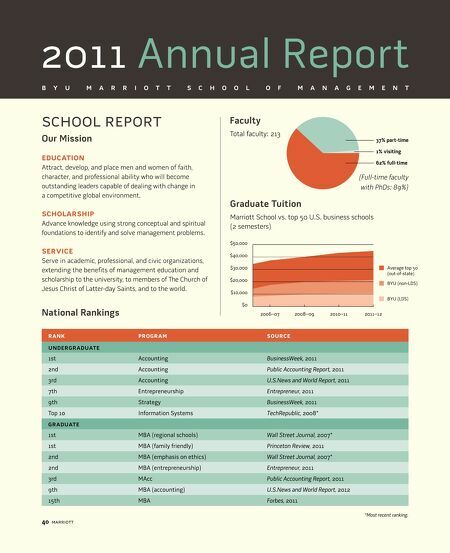 2011 Annual Report BYU Marriott School of Management Our Mission Education Attract, develop, and place men and women of faith, character, and professional ability who will become outstanding leaders capable of dealing with change in a competitive global environment. Scholarship Advance knowledge using strong conceptual and spiritual foundations to identify and solve management problems. Service Serve in academic, professional, and civic organizations, extending the benefits of management education and scholarship to the university, to members of The Church of Jesus Christ of Latter-day Saints, and to the world. 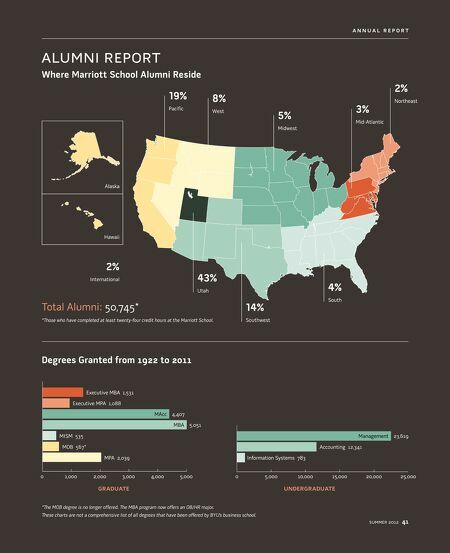 Faculty Total faculty: 213 37% part-time 1% visiting 62% full-time (Full-time faculty with PhDs: 89%) National Rankings Undergraduate: 1st Accounting BusinessWeek, 2011 2nd Accounting Public Accounting Report, 2011 3rd Accounting U.S.News and World Report, 2011 7th Entrepreneurship Entrepreneur, 2011 9th Strategy BusinessWeek, 2011 Top 10 Information Systems TechRepublic, 2008* National Rankings Graduate: 1st MBA (regional schools) Wall Street Journal, 2007* 1st MBA (family friendly) Princeton Review, 2011 2nd MBA (emphasis on ethics) Wall Street Journal, 2007* 2nd MBA (entrepreneurship) Entrepreneur, 2011 3rd MAcc Public Accounting Report, 2011 9th MBA (accounting) U.S.News and World Report, 2012 15th MBA Forbes, 2011 *Most recent ranking.